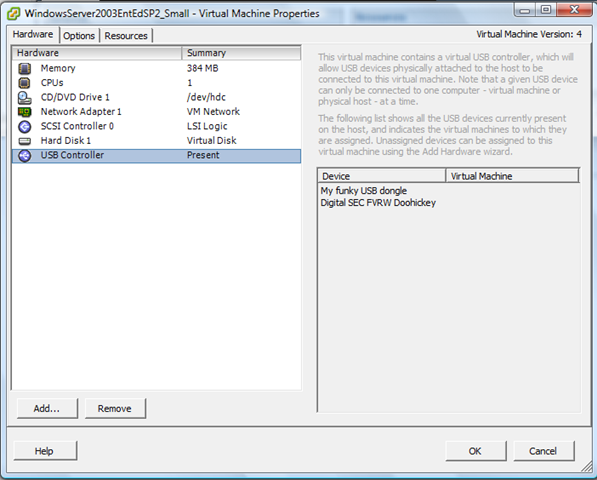 Funky USB Device Entries After Using VM Converter..
I’ve noticed this a couple of times, if you P2V a VM from VM Workstation to ESX using VM Converter – it brings across a virtual USB device which isn’t supported by ESX.. if you look at the properties you get the following amusing entries..
Now, I wish I really did have a funky USB dongle, or doohickey… sounds useful! 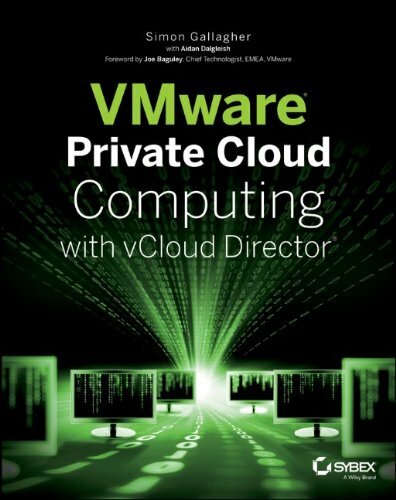 As noted here there is a doc that has been jointly produced between VMWare and Cisco which has all the details required for integrating VI virtual switches with physical switching. Especially handy if you need to work with networking teams to make sure things are configured correctly to allow failover properly between redundant switches/fabrics etc. – it’s not as simple as it looks, and people often forget the switch-side configurations that are required. Can you run ESX as a VM under ESX? Crazy, yeah – but hey you’ve got to try it, prompted by a question from Prasad – can you run ESX in a VM under ESX? 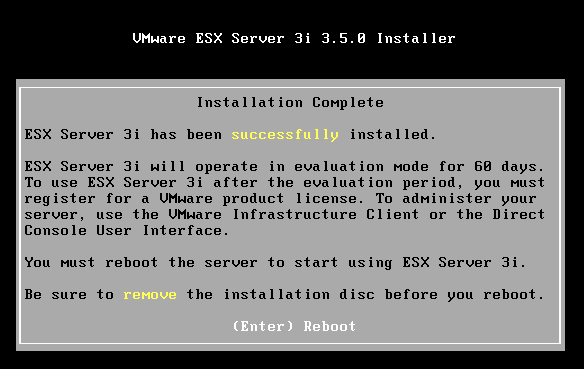 good news, the VM converter did it’s thing and it does start up on the ESX box. ..bad news, it doesn’t get past this screen as far as I can tell…it’s sat there for a good 20mins so I don’t think its going to get much further. 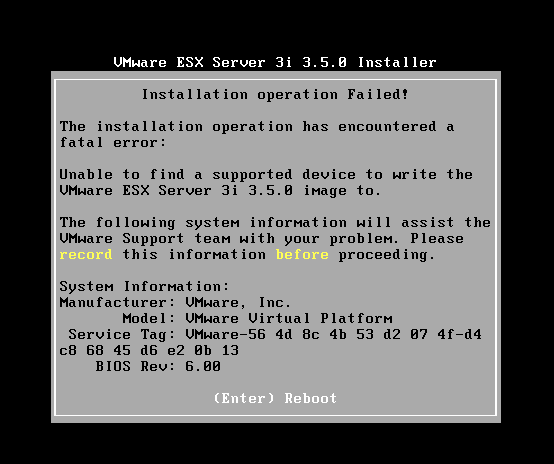 Also tried to import my ESX 3i image to see if that would work, but VM Convertor wouldn’t import it for some reason, so will have to try a clean install on that. Looks like some kind of error when it’s trying to determine what version it is..
Ah well, anyone know how to get this going/if it’s possible? 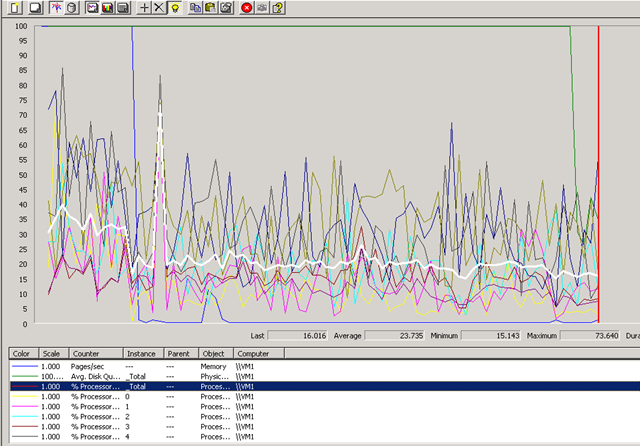 Note to remember, don’t forget to check the duplex settings on NICs handling your vMotion traffic. My updated clustered ESX test lab is progressing (more posts on that in the next week or so)… and I’m kind of limited in that I only have an old 24-port 100Mb Cisco hub for the networking at the moment. vMotion warns about the switch speed as a possible issue. I had my Service Console/ vMotion NICit forced to 100/full and when I 1st tried it vMotion took 2hrs to get to 10%, I changed it to auto-negotiate whilst the task was running and it completed without breaking the vMotion task ain a couple of seconds, dropped only 1 ping to the VM I moved. Cool, it’s not production or doing a lot of workload but useful to know despite the warning it will work even if you’ve only got an old hub for your networking, and worth remembering that Duplex mis-matches can literally add hours and days onto network transfers. If you deploy your VM’s from a master image using Virtual Center’s Deploy from template functionality (below). Are you sure you want to delete this VM and it’s associated base disk? Please note if other VMs are sharing this base disk, they will no longer have access to this disk. This does not refer to the master VM image you deployed from; in other words if you delete the VM it does not break all other VMs deployed from the initial template. You’ve been able to buy solid state SAN technology like the Tera-RAMSAN from TMS which gives you up to 1Tb of storage, presented over 4Gb/s fibre channel or Infiniband @10Gb/s… with the cost of flash storage dropping its going to soon fall in to the realms of affordability (from memory a year ago 1Tb SSD SAN was about £250k, so would assume that’s maybe £150k now – would be happy to see current pricing if anyone has it though). 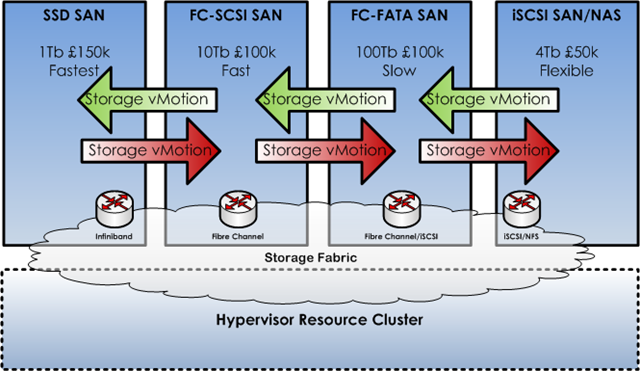 If you were able to combine this with a set of ESX hosts dual-connected to the RAMSAN and traditional equipment (like an HP EVA or EMC Clariion) over a FC or iSCSI fabric then you could possibly leverage the new Storage vMotion features that are included in ESX 3.5 to achieve a 2nd level of performance and load levelling for a VM farm. It’s pretty common knowledge that you can use vMotion and the DRS features to effectively load level or average VM CPU and memory load across a number of VMWare nodes within a cluster. Using the infrastructure discussed above could add a second tier of load balancing without downtime to a DRS cluster. If a VM needs more disk throughput or is suffering from latency then you could move them to/from the more expensive solid-state storage tiers to FC-SCSI or even FATA disks, this ensures you are making the best use of fast, expensive storage vs. cheap, slow commodity storage. I also see EMC integrating flash storage into the array itself, would be even better if you could transparently migrate LUNS to/from different arrays and disk storage without having to touch ESX at all. The new VMWare Certified Design Expert (VCDX) certification – next step up from VCP, will have to have a look into it now I’ve finally managed to re-schedule my cancelled QA course – official VM announcement here. VMWare are shaping up to have a really good set of management tools – lab and site recovery manager are of particular interest to me for several projects I’m working on. The following screen dump is from an HP DL380G5 server that runs all the core infrastructure under VMWare Server (the free one) for a friend’s company which I admin sometimes. It is housed in some co-lo space and runs the average range of Windows servers used by a small but global business, Exchange SQL, Windows 2003 Terminal Services. As a result of some planned (but not very well communicated!) power maintenance the whole building lost power earlier today, when it was restored I grabbed the following screenshot as the 15 or so Virtual Machines automatically booted. There are no startup delay settings in the free version of VMWare Server so they all start at the same time, interesting to note the following points.. The blue line that makes a rapid drop is the pages/second counter, and the 2nd big drop (green) is the disk queue length. 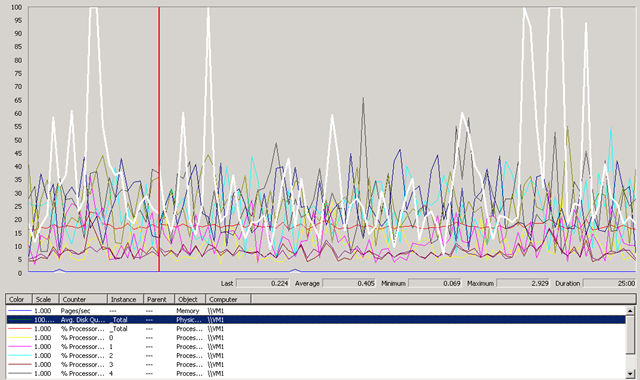 the hilighted (white) line is the overall %CPU time, note the sample frequency was 15 seconds on this perfmon. After it had settled down, I took the following screenshot, it hardly breaks a sweat during its working day. there are usually 10-15 concurrent users on this system from around the world (access provisioned via an SSL VPN device) and a pretty heavily used Exchange mail system. It runs Windows 2003 Enterprise Edition x64 edition with VMWare Server 1.0.2 (yes, its an old build.. but if it ain’t broke..) and they have purchased multiple w2k3 ent-edition licences to take advantage of the virtualisation use-rights to cover the installed virtual OS’es. The DL380 has good redundancy built in, but it’s also backed up with a h/w maintenence contract, and they also have a spare cold-standby server to resume service from backups if data is lost. Less noise, the old servers were dotted around their old offices in corners, racks etc – this is the main thing they liked! Less reliance on physical offices and cheap DSL-grade data communications, now the servers are hosted on the end of a reliable, data centre class network link with an SLA to back it up. if an individual office looses its ADSL connection, no real issue – people pick up their laptop(s) and work from home/starbucks etc. Hopefully this goes to show the free version of VMWare’s server products can work almost as well if budget is a big concern, ESX would definitely give some better features and make backup easier, they are considering upgrading and combining with something like Veeam Backup to handle failover/backup.